- not a substitute for sunscreen. Heliocare 360˚ Capsules are a potent anti-oxidant supplement that’s clinically proven to help attack against the free radicals that can accelerate aging. Free radicals damage vital skin cells and tissues which, over time, accelerates the visible ageing of the skin, causes uneven areas of pigmentation and can damage skin health. Exposure to daylight and the sun is the main cause of free radicals within the skin. Even the highest-level broad-spectrum topical protection is not enough to protect skin against these free radicals – this is especially the case during extended periods of time spent outdoors, or holidays. 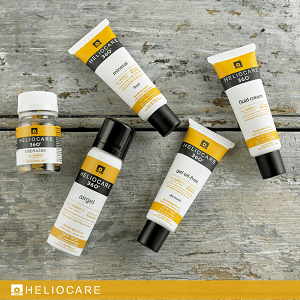 Heliocare 360˚ Capsules are a powerful anti-oxidant supplement, clinically proven to help defend against the free radicals that can age your skin beyond your years and impair skin health. Each Heliocare 360˚capsule contains Fernblock+, a uniquely prepared extract from the clinically proven fern Polypodium Leucotomos that helps to protect the skin from within, providing powerful anti-oxidant activity against free radicals. The anti-oxidant activity in Fernblock+ is boosted with the addition of a sophisticated complex of N-acetylcysteine, Vitamins B3, C and E and Prebiotics. The fantastic Fernblock anti-oxidant activity is also clinically proven to reduce the appearance of PLE; an unsightly red, blotchy rash that affects 10%-15% of the population! Take one capsule in the morning in addition to the application of your favourite Heliocare 360˚ topical product, especially during times of high exposure to the sun or prolonged periods of time spent outside.